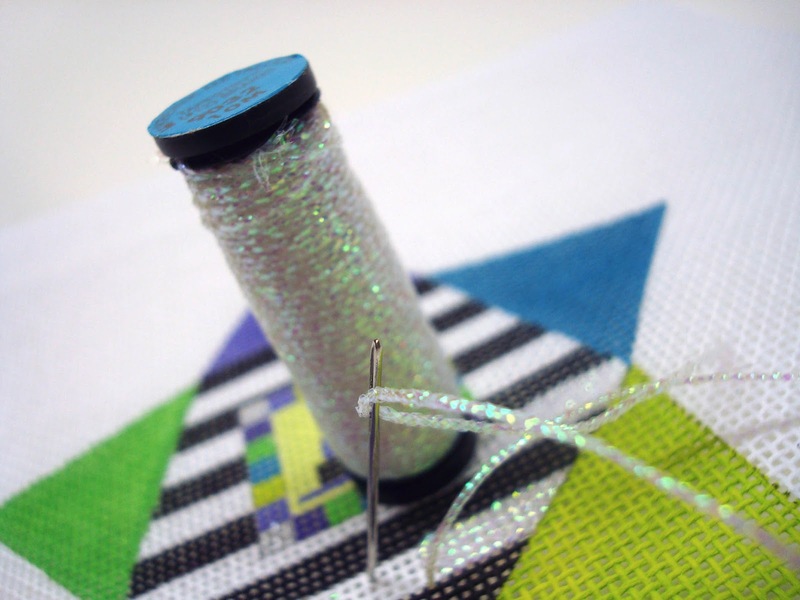 There is a new thread in town, offering stitchers, crafters and fiber artists a new way to achieve prismatic color and optical effects in their projects. It's pearl on steroids, pearl hi lustre, Easter grass gone wild…it's color 9032 Easter Braid. 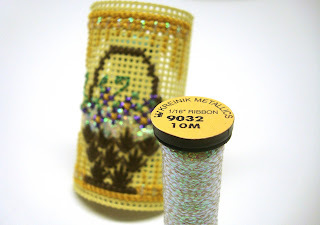 Last year, we introduced translucent Kreinik Easter Grass™ by specific request from one of the most talented and prolific needlepoint designers, Meredith Willet of M's Canvashouse (store) and Elizabeth Turner Designs (needlepoint canvases and finishing). We turned that Easter Grass into this year's new Easter Braid™. Kreinik Easter Braid™ is a bolder version of our classic 032 Pearl color. It brings to mind the whimsical lightness of soap bubbles and the crystalline color of snow. At once purple, then green, then pink, then white...it dazzles in the light to create a color of depth and dimension, which gives you more visual interest in your handwork or machine embroidery. It’s a pretty pearl—and more. One of the most versatile colors we've ever created, Easter Braid has the chameleon-quality to pick up color around or beneath it. Use it to intensify color on a painted needlepoint canvas, to blend subtly into colored cross-stitch fabric, or magnify print on quilt cottons. We have already heard that fly tyers are raving about the shimmery color for making irresistible lures. So don't let the name determine the use; it's not just for "Easter" designs. When we handed out samples at the recent TNNA needlearts trade show, needlepoint designers started using it in projects as diverse as winter, Halloween, Christmas, wedding, baby, Easter, and confection-themed designs. Choose from a variety of thread sizes (thread weights) to match your particular creative technique: needlepoint, cross stitch, knitting, crochet, weaving, papercrafts, and more. It is available in Kreinik Blending Filament, Very Fine #4 Braid, Fine #8 Braid, Tapestry #12 Braid, Medium #16 Braid, plus 1/8" Ribbon and 1/16" Ribbon. 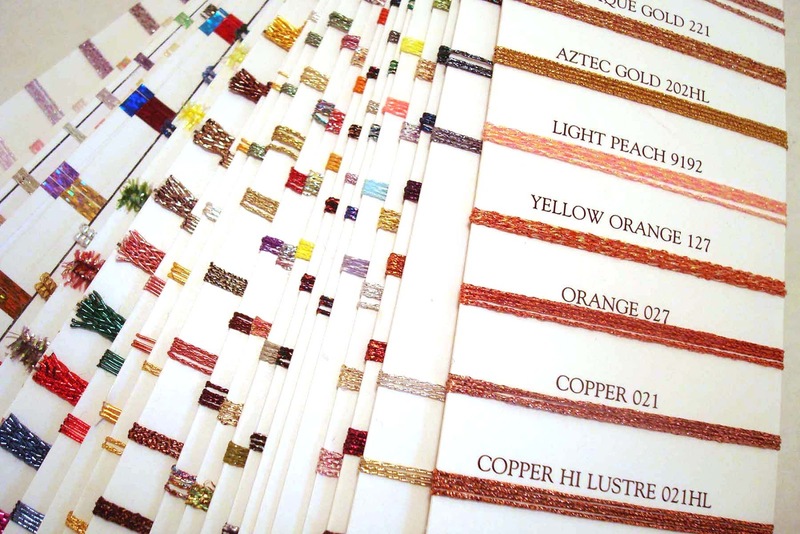 Actual threads wrapped on cards…swatches of every Kreinik color...have the whole thread selection at your fingertips…what a good idea! 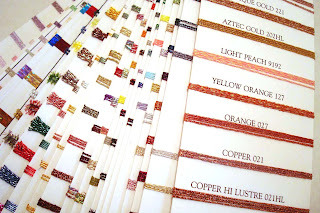 These fabulous tools are called color cards, and they are available from Kreinik for the silk, metallic, machine sewing, and iron-on thread lines. Whether you are a professional pattern designer, a store owner, a kit maker, a fiber artist, or a do-it-yourselfer designing custom projects, a color card puts a manufacturer's thread inventory in your hands. It is a design tool, an organizing tool, a reference tool. There has been some online talk recently about color cards from thread manufacturers, and whether they consist of just photographs of colors or actual threads. We want to spread the word that the Kreinik color cards have actual threads on them. So if you are doing color matching or planning projects, you can see exactly what a color looks like — in your home, shop or studio, in various light sources, next to certain fabrics, etc. For convenience, we offer digital photos of all Kreinik colors on our web site at www.kreinik.com. You can also download a PDF of a 'pocket' color chart for each thread line (silk, metallic, machine sewing, iron-on), featuring photos of all Kreinik colors here: Kreinik Color Charts. Until we can all afford 3-D printers, we can't have actual threads coming out of your computer screens, so in a pinch the photos give you a pretty good idea of a color. It is ultimately the most helpful to flip and search, match and coordinate based on real colors rather than photo swatches, however. So the Kreinik Metallic Color Card has thread samples of 350+ Kreinik thread colors wrapped around panels. The Kreinik Silk Color Card has swatches of 200+ colors. When new colors are added, updated panels are created. For any creative person, these cards are an easy and economical way to have a thread palette on hand at all times. I looked up your color chart for metallics. It is enormous! I found your color family cards, but they are only for purchase, and I could not view this on-line. Could you please give me the progression of color from light to dark (or visa versa) of your golds and your silvers. I have some from a variety of projects and need to organize them for a new project, by light to dark or visa versa. I have a hard time differentiating between some with subtle differences. What a great idea! We have compiled lists of Kreinik gold and silver colors in shading progression order, based on our observations. Keep in mind that dye lots can vary, and people see color differently. However the lists below should make an organized starting point for planning your own projects. Click here to purchase a Kreinik Metallic Thread Color Card (consists of actual thread swatches).